My name is Carrie Anne. I am a geek, and these are my diaries. They are a collection of video logs about using and making technology, along side interviews with inspirational women in the fields of computing, science, technology and engineering. They also include video contributions from women working in IT and Science, and include ‘Geek Gurl Diaries On Air’ panel discussions with graduate computer science students on various topics like computer gaming and geek culture. They begun when in 2012 whilst I was working as a Computing and ICT Teacher in East London. I noticed that the uptake of ICT and Computer Science by teenage girls at KS4, KS5 and higher education was also just as limited, and that female students would opt for subjects which are seen as more creative such as Art, Dance, or Humanities. As a woman in tech myself I started to think about what I could do to improve the status quo. What was it about science, technology and computer science that excited me, and how could I get that across to young people? I knew that I wanted to develop a network of individuals who could through their own experiences inspire a generation to take up more traditionally geeky subjects. The theory being that by exposing students to the range of creative and exciting scientific careers in technology, they may discover an interest in a field they had previously dismissed. Utilising my skills as an enthusiastic teacher of ICT, I set out to provide teenagers with an opportunity that I never had, access to people working in the tech industry, and resources demonstrating how to create, build, make or do different tasks using tech skills. I created a channel for all my ideas and The Geek Gurl Diaries were born. I hope that my diaries will give young people first hand access to content that will inspire them and perhaps nurture an interest in subject areas they have dismissed before. I am on a mission, with the help of some friends, to make Computer Science and other STEM subjects epic for all. The Geek Gurl Diaries on YouTube is hosted, written and produced by Carrie Anne Philbin. 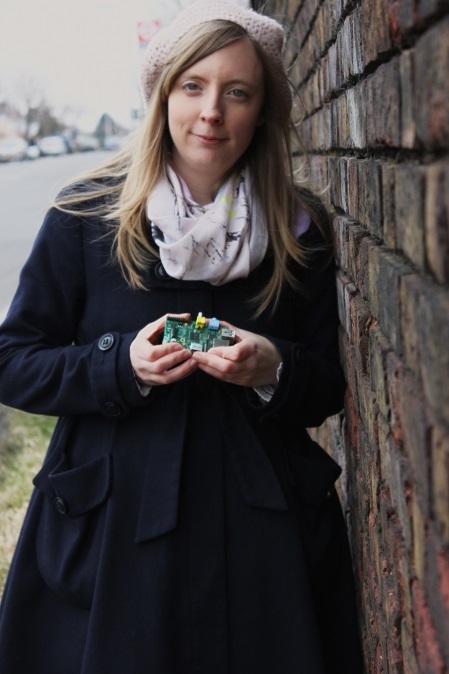 Carrie Anne is also the author of Adventures in Raspberry P, a full colour coding book for young people to help them get started with Raspberry Pi. Don't miss out, get your copy today! Carrie Anne Philbin of Geek Gurl Diaries named Talk Talk Digital Hero 2013 for her work inspiring more girls to take up stem subjects. Read Skype's blog post about naming Carrie Anne, Skype Moment Maker! Carrie Anne speaks to Computer World about Adventures in Raspberry Pi, and the Foundations education mission. Learn more about Geek Gurl Diaries creator Carrie Anne Philbin and her work inspiring the new generation of computer scientists!